I’m not posting about Thanksgiving today because we didn’t have any time to celebrate. I makes me sad that we couldn’t and also tat we couldn’t be with friends and family for turkey and pie. Especially the pie. But we might do a little turkey time next week-end and if we do, there’ll be something delicious posted here on Monday. We belong to a food co-op and it’s fantastic. But I had deadline fast approaching and the leeks were still in my crisper drawer. Which is to say, I forgot about them until the day before we were supposed to pick up our share of fruits and veg. So I whipped up a little something to please my inner frugalista and not waste my leeks (or in this case, leek, singular) and feed the little people. I’m lucky enough not to have super picky little people, but little c definitely has more preferences than his older sister. He will eat chickpeas and sweet, green peas, though. And noodles. What 2-year-old doesn’t like noodles? 1 leek (2 if you like) cut in half lengthwise, sliced and rinsed. 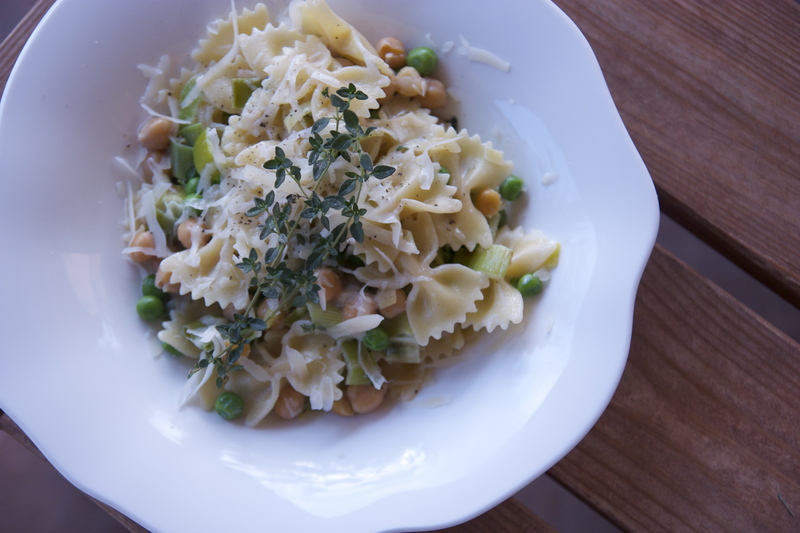 In a pot of boiling, salted water, cook pasta until al dente, adding the peas and chickpeas for the last 2 minutes. Meanwhile, heat the oil and butter in a large pan. Add leeks and sauté until soft (about 3-5 minutes). Season with salt and pepper. Add the milk/ cream and cook for 2-4 minutes, until reduced slightly. Toss pasta and a little of the pasta water with the cream and leek mixture. Serve with grated parmesan and the lemon thyme sprinkle on top. The Verdict: Earthy and good. I’d like a little more color, but not bad for using up what I had in the fridge. And the little people ate it up. Winning.